PlaceToLive.in - Blogs: Builders : No Price Cuts Planned !! Builders invariably will be subjected to pressure from buyers, if buyers are more organized via a Google Groups / Orkut Community, etc., as was the case in the DLF scenario. So they need to come up with convincing answers on why they cannot do so or should give in to the pressure and reduce the prices. In response to a question about DLF cutting prices for its projects in Chennai and Bangalore, and if other builders are likely to follow suit, Mr.Abhisheck Lodha, of the Lodha Group, says..
"We have to learn from this story. Overall it creates a negative impression with the existing buyers. It is important to get the value equation right. The customer is not willing to buy unless he sees value in a product. The pricing has to be spot on for buyers to walk in. We have managed to sell 1,000 units of our CASA brand of affordable- luxury homes in Thane near Mumbai between December 15 and February 2." Mr.Abhisheck Lodha's point is the initial pricing needs to be right and hence will not require correction. 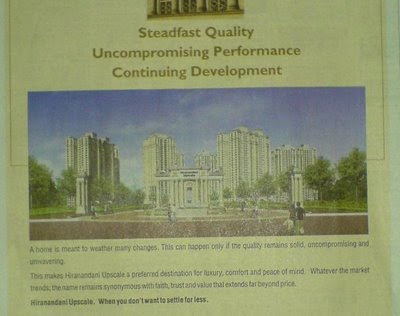 Hiranandani has also put out an advertisement in today's Property Plus (Supplement to The Hindu), highlighting the fact that it does not plan to reduce costs. Whatever the market trends; the name remains synonymous with faith, trust and value that extends far beyond price. Hiranandani Upscale. When you don't want to settle for less. DLF had quoted reasons like the changing economic scenario, reducing costs of construction and lowering interest rates had enabled it to pass on the benefits to customers, when DLF announced the price cut. Does that mean the same reasons have no effect on other projects ? !